A year ago, Emergency Room doctor Josie Zizzo lost her husband to the violence in war-torn Syria. Watching him die while bullets rained down on their makeshift hospital, left her suffering from Post-Traumatic Stress disorder. Returning to work in the ER proved impossible, the PTSD throwing her back in time to the awful day her husband died. In an effort to heal, Josie buys a B&B in the US Virgin Islands, but the property needs more repairs than she anticipated. Her best friend promises to come help, but it’s her best friend’s brother who steps off the plane, firefighter Mark Durant. Mark is the last man she dated before meeting her husband, a man she loved, a man who walked away from her when she asked for more than a causal relationship.Mark has come to help Josie because he’s suffering his own PTSD nightmare and hopes the sun, sand and time spent with the most giving woman he’s ever met will help him heal. It isn’t until he steps off the plane and sees Josie’s shocked face that he realizes his sister has set them both up. Now he’s sharing a house with a woman he wants more than his next breath, who’s also fighting her own terrifying memories. It isn’t until a storm hits the island that they’re forced to face their pasts and all the ghosts that haunt them. Can love survive nature’s wrath and their personal demons? Not a cloud in the sky, the winds were fair and from the east. The late-morning heat was enough to put even the most athletically inclined person into a doze. The perfect time to land on the sand and hunt down some treasure—or in this case, fix it up, make it all shiny, and hope the tourists showed up. At least, that’s what Josie Zizzo hoped. Then again, nothing had gone the way she’d hoped for the past year. Oh, who was she kidding? Her life had virtually ended when her husband died in front of her eyes. Both of them were emergency-room physicians, though at different Boston hospitals. They’d signed on to a medical mercy mission in Syria. One week into the mission, their makeshift hospital had come under fire by two different groups. Her husband, Adler, had been hit in the chest. Unable to move because of constant gunfire, she’d watched, every second a stab to her gut, a slash to her heart, as he bled out. It had taken her a week to get home to Boston with her husband’s body. Another week before his service and burial, then twelve weeks to realize she’d never be able to go back to life as she knew it again. Her first shift back in the ER had made her new reality clear. The noise, the people, the blood—suddenly she was back in Syria watching Adler die. Again. Post-traumatic stress disorder, they’d said. She needed therapy, time, and probably a different job, for a while at least. So she’d left the hospital and began searching for something completely different from her Boston home. It took her six months to figure out what she wanted, but she finally decided on an entirely new way of life. A bed-and-breakfast. The Caribbean. Pirates. 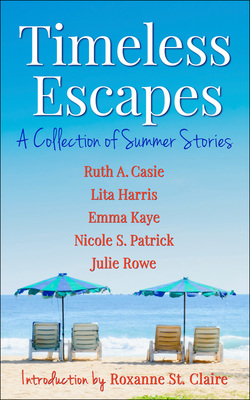 Of all the dreams she and Adler had together, running a B&B on an island that had once been home to convicts, rum runners, and the infamous pirates wasn’t one of them. She bought the first property that had appeared feasible. Something that needed fixing to make it nice. So when she arrived on the island of St. Thomas six weeks ago to take possession of her new home it had been with the hopes of getting the place ready for her first guests within a month. That time frame had been unceremoniously dashed against the rocks. The Pirate’s Cay, as her B&B was known to the locals, had needed a lot more repairs than she realized from the report and pictures the real-estate agent had sent her, but because the home had sold for a lot less than fair market value, she really couldn’t complain too much. The price had been too good to be true. Thankfully, she’d called on her best friend, Benita Durant, to come to the island to help her out for a few weeks. Benita had been her rock after she’d gotten back to Boston from Syria. Helped with the service and burial arrangements. Encouraged her to move to the Caribbean, saying the sunshine, heat, and slower lifestyle were just what the doctor ordered. Between the two of them, they could get it all done. All Benita had to do was get off the plane and pick up her luggage, then they could get to work on making The Pirate’s Cay the island’s hidden gem. Yeah, keep telling yourself that, Josie. You’re just putting off the inevitable mental meltdown. So here she was, at the airport stretched up onto her tiptoes, looking for Benita’s brown ponytail among the passengers exiting the luggage carousel area. A group of laughing vacationers from somewhere cold—given their lack of tans—blocked her view for a couple of minutes. When they cleared out of the way, Benita wasn’t in sight, but her brother was. The sight of him kicked her in the diaphragm like a bad-tempered mule. Mark Durant stood six foot two and had shoulders to match his height. Built like a football linebacker, he didn’t need to tackle Josie to push her over. A puff of wind would have done the job. Mark was the last man she expected to see. The last man she’d dated before meeting Adler. A man she had wanted with every breath in her body, but walked away from because she wanted what he couldn’t give her. A marriage. A home. A family. A man who’d told her in no uncertain terms he wasn’t ready to settle down. “Hey,” he said, staring at her with a gaze that never wavered and a smile that bordered on sinful. His voice flowed over her like dark chocolate, heady and rich. She swallowed around a lump the size of Manhattan to say, “Hi.” It came out like a croak. He stared at her while she tried to process the fact that her best friend, whom she’d talked to only yesterday, had set her up. “Yup,” Josie said. She tried for a weak smile, but highly doubted it looked happy at all. Mark, who had his duffel bag slung over his shoulder, dropped the bag on the floor. He shoved his hands in his jean pockets. “She told me you needed… She showed me pictures and an email you’d written asking for…” His voice trailed off and his gaze dropped to his bag. “Help?” Josie finished for him. He had the best puppy-dog eyes of any man she’d ever met. Hands down, bar none. Years disappeared and it felt like yesterday when he’d last kissed her, put his hands on her body, and made love to her. It weakened her knees and turned her breathing into something totally optional. Well, wasn’t this just ducky. Hell of a time for her libido to come out of hibernation. That duffel bag was full. He hadn’t planned a short trip. That rocked her back on her feet. Heh, she should have asked his opinion before she bought it. And he’d come all this way to help her, despite knowing the status of the B&B.